You will be greeted and picked up by the tour guide and driver at your hotel in Hanoi by 7.30 AM. Setting off for the morning drive to Sapa, a quiet mountain town and home to a great diversity of ethnic minority peoples. The journey on the national highway – Noi Bai – Lao Cai offers you a scenic drive from the Red River Delta to the high land. Arrive at Sapa around noon and have lunch at a nice restaurant in town. In the afternoon, we will start the trek to Muong Hoa Valley, start with Cat Cat village of the black H’mong ethic group. Along the trek, you will have a close look at the beautiful rice terraces and amazing life of the hill tribes in the area. 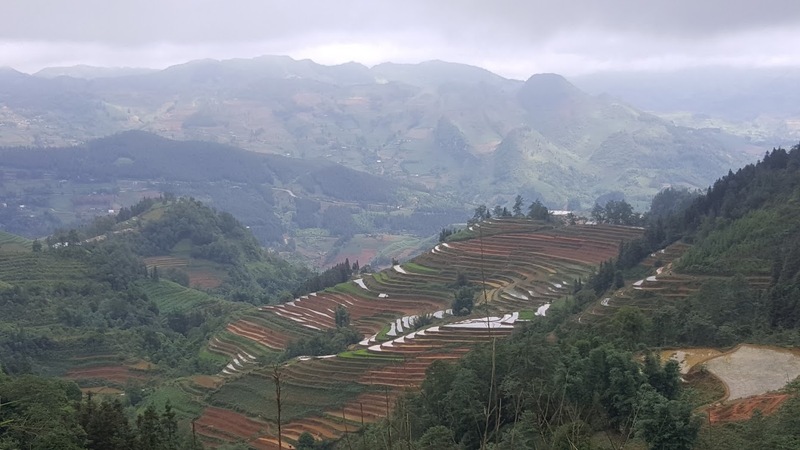 The beautiful trek will end at a local house for a homestay night or back to Sapa town for overnight at a hotel as the alternative. This morning is free for you to explore the town with shopping or just relax and enjoy the facilities of the hotel. In case you would like to keep busy, your tour guide and driver will accompany with you to visit some waterfalls like Silver Waterfall and Love waterfall near the Hoang Lien Son national park. Lunch on your own account in town. In the afternoon, you will take a 3,5-hour drive to Bac Ha district. Have a stop on the way to talk a gentle walk to visit a hill tribe village which is located at a peaceful valley. Check in to a hotel for rest and overnight in Bac Ha. Bac Ha district is famous for the most colorful hill tribe markets in Vietnam. This morning, after your breakfast at the hotel, the tour guide will take you to visit a market (Bac Ha market on Sunday, Can Cau market on Saturday, Coc Lu Market on Tuesday) where you can take beautiful photos and witness the local people trading and enjoying their specialty food. After the market, we will get back on the private vehicle and spend most of the afternoon drive to Hoang Su Phi. Upon arrival, check in an eco-lodge for the night. The drive today is spectacular as the entrance of the geo-park opens from here. The imposing grey limestone mountains and unbelievable life of the H’mong people on the rock will definitely amaze you. Visit the H’mong King Palace, Pho Bang ancient town whose lanes are filled with traditional Chinese-style houses, the last stop with breathtaking scenery at Ma Phi Leng Pass over Nho Que River is also a great highlight of the day. Check into a hotel and overnight in Meo Vac. On Sunday, there is a big market in the town so we are open for this and see how our schedule could work it out. The long drive today will take you downhill to Ba Be National Park. Lunch on the way. Arrive at Pac Ngoi village of an ethic minority in the late afternoon. Dinner and overnight at a home stay. After breakfast, spend most of the morning exploring the lake and Nang River. The activities will include a cruise though this Vietnam’s biggest fresh water lake, a visit to Dau Dang water fall, Puong cave. Around noon, get back on your private vehicle to Cho Ra town for lunch at a local restaurant. After that, we will head for Cao Bang. Arrive in Cao Bang City and check into a hotel for the free evening and dinner on your own account. Overnight at a hotel in Cao Bang. After the breakfast at your hotel, we will embark the morning drive to the remote area, Trung Khach District. Have a short stop on the way to visit Phuc Sen village of the Nung people where you can learn how basically the local blacksmiths are making their farming tools such as knives, sickles, plough plates… Arrive at the Waterfall around 11.30. Take a short walk down to Quay Son River and get on a bamboo raft to visit the most beautiful waterfall of Vietnam. Have lunch at a local restaurant nearby. In the afternoon, continue on with a visit to Nguom Ngao limestone Cave, which is located about 2 km from Ban Gioc. Walking through this cool cave offers you a great chance to admire how wonderful the stalagmites and stalactites have been formed. Back to car and return to Cao Bang City. Overnight in Cao Bang. Check out of the hotel after breakfast and get ready for the morning drive to Bac Son Valley in Lang Son province. The drive includes some stops on the way for you to take photographs whenever you want. Arrive at Quynh Son village of the ethnic Tay people and have lunch on a stilt house. This afternoon you will walk to visit the village and hike up to the top of the telephone-station mountain for a stunning scenery over the valley. This is a great point for those who love photographing. Dinner and chat chit with the host of our homestay tonight. After the traditional breakfast, this morning we will embark on a 3,5-hour hike on a rural back road. Along the hike, you can have a close look at the local farming, enjoy the peaceful atmosphere in a good harmony of mountains, forests and local life. At the end of the hike we get picked up by our private transport and go for lunch. In the afternoon, we will head down to the coast and stay overnight at a hotel in Halong City. This morning, you will have breakfast at the hotel and have an easy morning: free and rest. Check out your hotel by 11.00 AM and transfer to the pier for boarding a boat for discovering the UNESCO listed heritage. Visit a cave, swimming on a sandy beach, kayaking around the karsts… Dinner and overnight on boat. Get up early for the fresh air on the top deck with a cup of warm coffee/tea if you wish or you can stay longer in your cabin until breakfast time. After the breakfast, you will have further cruise to other parts of Halong Bay and get on the tender to visit a fishing village, learn how the fishermen make living on the water. Enjoy a wholesome brunch before getting back to harbor at noon. Thence, get back on to your private vehicle for the afternoon drive back to Hanoi and finish this lifetime travel loop! According to the local culture of the Tay ethnic minority, the guests those are travel in couple are not allowed to sleep together (share the same bed) in their houses. Their regulation is that male and female (even you are husband and wife) have to sleep separately. If you don’t accept this, the alternative is staying at a basic guest house in the nearby town. Please let us know your choice at the booking time. What do you think of Northern Vietnam The Panaroma Tour 12 Days?